When new Facebook features are added, scammers use the chaos, confusion and disdain to take advantage of unsuspecting users. The most recent instance involved the Facebook Ticker. There are ways to remove the Ticker by using browser extensions; however, there is no such fix for the Facebook Timeline. Timeline is being rolled out to all users. If you don’t have it now, then you soon will. If you have already made the switch and don’t like it, well, the bad news is that you are stuck with it. There is no way to revert back to your old profile. Notice that the top result has already amassed over 10,000 likes. Most of these require you to ‘like’ the page and ‘share’ a message with your Facebook friends. 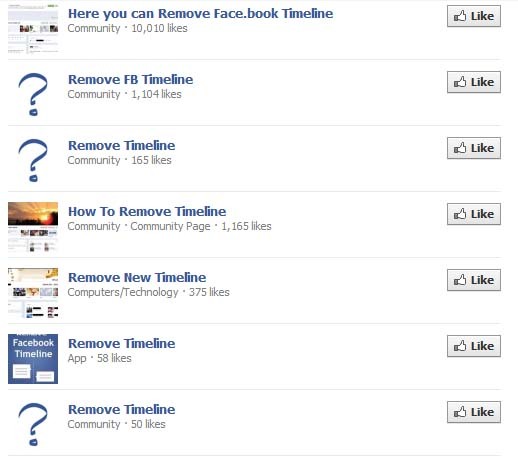 There are also several browser plugins that offer to remove Facebook Timeline. You really aren’t removing Timeline. The plugin either either customizes the Facebook layout to a certain degree, or it tricks Facebook into thinking you are using Internet Explorer 7. Currently, Timeline isn’t compatible with this version of I.E. A word of caution – some of the plugins are malicious and have been known to spread malware. As with third party Facebook applications, we strongly advise that you only install browser add-ons from trusted, well-known sources. And just because an extension is located in the Chrome Web Store doesn’t mean it’s. There have been instances where rogue extensions infect users before being shut down by Google. Socialfixer, formerly known as Better Facebook, is a trusted and well known plugin that thousands use to customize their Facebook layout. Though, you won’t be able to remove the Timeline with this plugin you’ll still be able to customize and streamline it to your liking a great deal. If you or your friends fall victim to one of the scams, then use the guides listed below to remove Facebook applications or Rogue Browser Plugins.